Along with other building materials, the sculpture was added to an Amazon.com site on Boren Avenue. 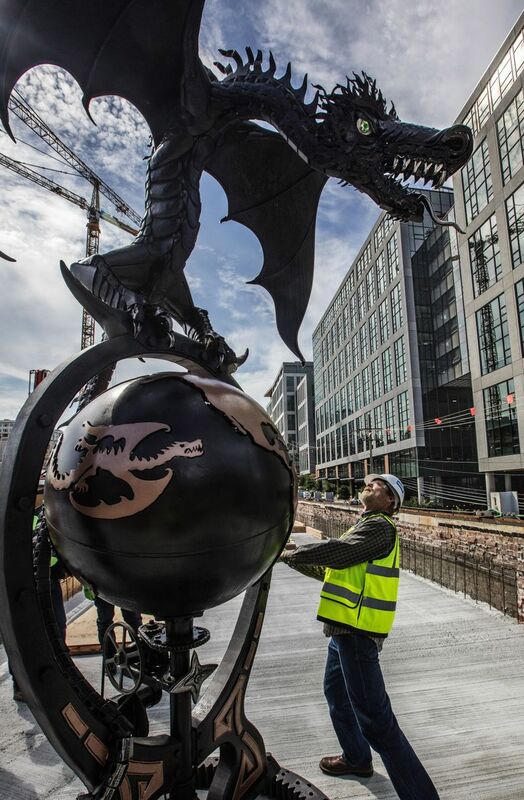 A fire-breathing dragon landed in Seattle at a busy South Lake Union construction site on Monday, but it didn’t fly in on its own power. A crane from construction firm Lease Crutcher Lewis brought the 12-foot-tall, 2-ton sculpture to rest at 300 Boren Ave. N., the site of a future Amazon.com building. “It’s an ancient symbol, the dragon, and it goes as far back as roots can go in the origin of man, and it does symbolize yin and yang,” said the sculptor, Marcus Devine, of Toledo, Lewis County, who creates dragons out of copper, iron, steel and scrap metal. 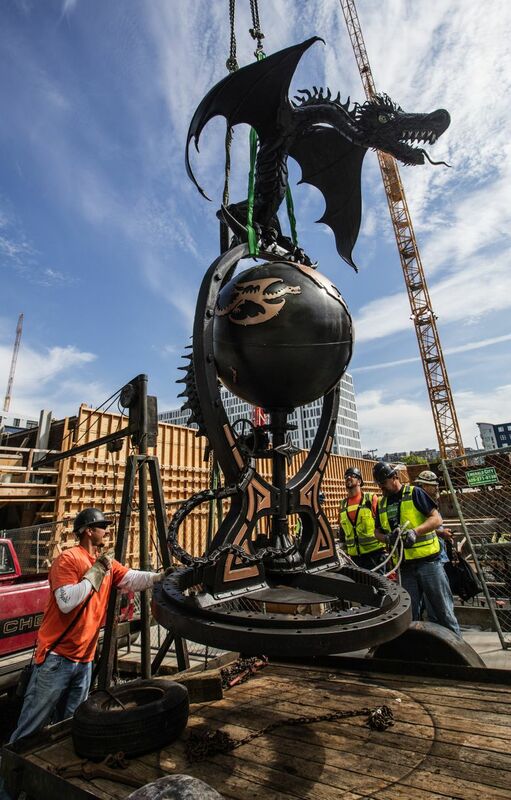 The steel dragon is attached to the top of a bigger sculpture by Devine, and its levitation above the construction site was the brainchild of construction superintendent Ron McDonell, who collects Devine’s dragons in addition to Harley-Davidsons and hot rods. The sculpture on the job site has not yet been sold. Previous dragons have sold to Brad Pitt, through a Santa Monica dealer, and to director Frank Darabont. Monday morning, the sculptor — who has no computer and just recently purchased a cellphone — drove the sculpture from Toledo to Seattle. Mc­Donell’s crew directed the crane, which took the dragon up onto the concrete slab that will be an open terrace of the building. For McDonell, who drew the skulls printed on his crew’s vests and hard hats, raising the sculpture on the job site is a fun way to engage his “eclectic” tastes in art. He first came across one of Devine’s dragons at a gallery in Bothell and got in touch with the sculptor, asking him to custom-build a piece for a lower price. The construction manager and the artist “hit it off” — they both liked art and bikes. For the artist, the sculpture portends many things. But then again, he said, it just means one thing. “It’s all about the world coming together,” he said of the piece, which he’s calling “Global Presence.” It recalls a design out of a Galileo sketchbook: a female dragon perches menacingly on an egg-shaped steel ring which contains a steel globe, out of which a baby dragon is hatching somewhere in the middle of the Pacific. It’s also equipped with copper wires that can be hooked up to a propane tank to breathe fire through the nostrils, and can project a multicolored “kaleidoscope” of the various continents from the globe in the dark. It can also turn on its circular platform. “I like the way its head twitches when it’s moving,” said McDonell, who had originally encouraged the sculptor to make the head look fierce. The fearsome look of the female, who represents mother nature, doesn’t have to be a negative sign, said Devine — she’s just “prodding” humanity to progress and adapt to natural change. “It’s always been mother nature prodding us. I think this is an epic piece in an epic time,” he said, mentioning the fires raging across Washington and the advent of green technology. Or perhaps it’s whatever people think it is, he said — regardless, he knows it means something. Seattle also is home to several dragons in the Chinatown International District that are not related to the Devine’s work. Andie Waterman: (206) 464-2052 or awaterman@seattletimes.com. On Twitter @WaterAndie.